A draft environmental impact statement for the planned MAX line from Portland to Tualatin will be crafted next year. 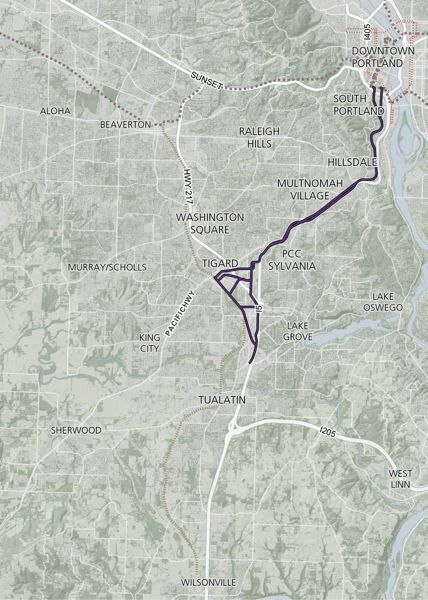 The steering committee for the Southwest Corridor Plan, a regional project that seeks to build a MAX light rail line from Portland through Tigard, made a few decisions Monday on what should be studied in a detailed review next year. Metro and TriMet planners, along with project consultants, will be working next year on a draft environmental impact statement for the U.S. Federal Transit Administration. Along with the ecological impact, the statement also will consider how the project would affect traffic and more. 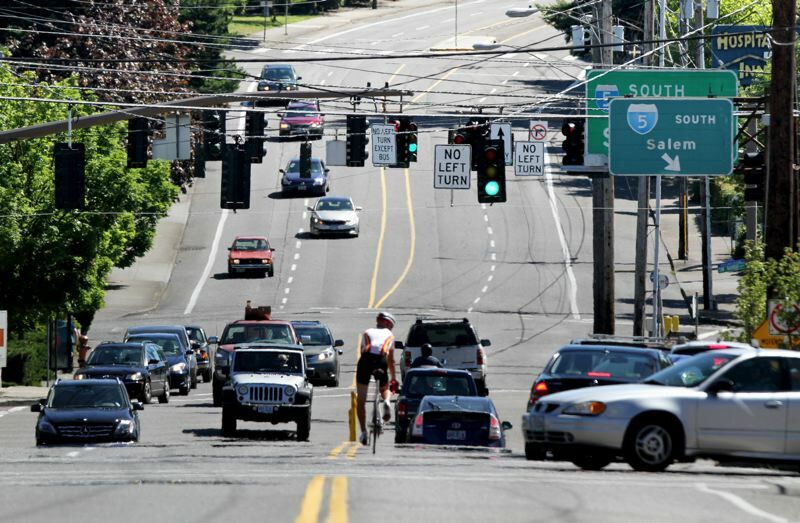 The steering committee, which includes local mayors and representatives from the Oregon Department of Transportation, Metro, TriMet and Washington County, had few quibbles with a set of recommendations from project staff that had been presented when it met last month. One of those recommendations was eliminating a planned MAX station in Tigard from further consideration. That station would have been located on Hunziker Street adjacent to Highway 217, and plans called for it to include a park-and-ride lot. "It's in an industrial area," Metro planner Matt Bihn explained. "It's difficult to get to because of the congested intersections near the freeway, and it also doesn't have great sightlines. We don't know if it's a great place for a park-and-ride. And removing the station speeds up the light rail. You have stations not too far away in downtown Tigard." The MAX line is planned to terminate at the TriMet park-and-ride located across Lower Boones Ferry Road from Bridgeport Village, just west of Interstate 5. Another staff recommendation on the approved list would be to study having up to 1,000 parking spaces at that park-and-ride. Durham Mayor Gery Schirado, whose small city is entirely within easy walking distance of the park-and-ride, had some concerns about that idea. "Given the access egress off of Exit 290 into Bridgeport, is that going to require any modification of those access egresses on I-5 in order to handle the traffic that would back up trying to access that park-and-ride?" Schirado asked. Bihn said the draft environmental impact statement will consider that issue, and smaller park-and-ride options at the proposed Bridgeport Village station will be studied as well. One more big cut to the Southwest Corridor project as it heads into the environmental review phase is on Mount Sylvania, where planners had kicked around the idea of a "mechanized option" to connect the Portland Community College campus to a planned station at 53rd Avenue, potentially similar to the Portland Aerial Tram that connects the South Waterfront district to the campus of Oregon Health & Science University on Marquam Hill. Planners recommended not including the tram or a similar option in the draft environmental impact statement, although Bihn said that would not preclude it from being built as part of a future project. Staff cited construction costs and neighborhood impacts as reasons to drop it from further study. 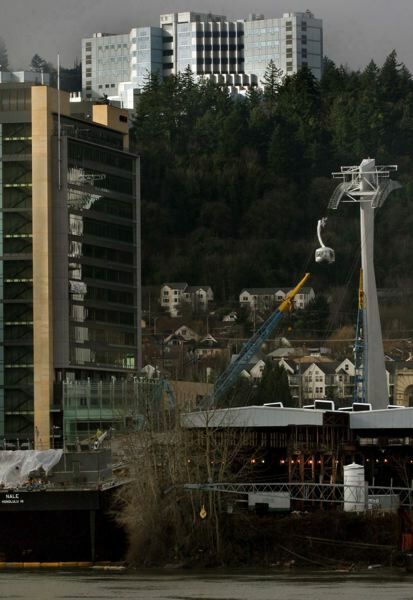 The Portland Aerial Tram infamously overran both its original projected construction and operating costs, with the project budget exploding from $15.5 million in 2002 to $57 million by the time it was completed in 2006. While accepting the recommendations of staff on the Hunziker station, Bridgeport Village park-and-ride and Sylvania tram options, among others, the steering committee elected not to make a final decision Monday on how to align the MAX line through Southwest Portland. Planners generally prefer the idea of running the light rail line down the center of Barbur Boulevard until about 60th Avenue, near Tigard city limits, at which point it would diverge from the state highway and veer south through the Tigard Triangle, an area bounded by I-5 and Highways 217 and 99W that the city of Tigard considers a prime district for mixed-use development. However, Bihn said, there is disagreement between Metro and ODOT engineers as to how confident that are that running the line along Barbur Boulevard the whole way to 60th Avenue would not create serious problems for vehicle traffic. While planners have downplayed the potential impact on travel times from adding a MAX line along Barbur Boulevard, and plans call for the road to be expanded — preferably complete with bicycle lanes and sidewalks — as part of the Southwest Corridor project, Bihn said putting in tracks down the center of the roadway could lead to construction delays and would restrict left-hand turns in places once complete. "It really comes down to: Are you comfortable enough with center-running Barbur to think that it's going to be successful … or are you nervous that we may have to bring back adjacent-to-I-5, in which case it should probably stay?" Bihn said. Bihn was referring to the Southwest Corridor project's backup plan: having part of the MAX line be built along Interstate 5 before coming up onto Barbur Boulevard. While the steering committee approved a recommendation by project staff not to consider having an I-5 alignment transition onto Barbur Boulevard at a complex intersection called the "Crossroads" — at which Barbur Boulevard, Capitol Highway and I-5 converge — members were not ready to drop an I-5 alignment from consideration altogether. "I think there's still a lot more information that we need to know, in my personal opinion," said Rian Windsheimer, ODOT's Portland region manager. "I'm really hesitant to make any major changes at this stage in the game," Beaverton Mayor Denny Doyle said, agreeing with Windsheimer. He added, "I don't like to propose stuff with only one option. … We're going to build it and we're going to live with it for a long time, so we better be darn sure that we're doing the best we can." Neil McFarlane, general manager of TriMet, suggested that planners should go forward with the draft environmental impact statement with the I-5 alignment tentatively included — but that they should do enough work early in the process to bring more information back to the steering committee that would help it decide whether running the MAX line along the freeway should be dropped from the remainder of the study. That idea met with support from other committee members, who unanimously approved a motion to adopt staff recommendations while keeping the I-5 alignment under consideration for now. Metro Councilor Craig Dirksen, who co-chairs the steering committee, suggested that the steering committee could again take up the alignment issue at its next meeting, which is not yet scheduled. Project manager Chris Ford said planners hope to have the draft environmental impact statement completed by next December. After a comment period, the steering committee would then work toward approving what is called a "locally preferred alternative," which would essentially be the alignment and layout for which Metro would seek funding to build. A mixture of funding from the state and federal governments and property tax revenue from Metro residents is expected to pay for the light rail project, which could cost close to $3 billion. Current plans call for a November 2018 vote on a levy, although Tualatin Mayor Lou Ogden argued Monday that project leaders should be prepared to push that back to 2020 or even later if necessary. "There was a high school football game one time when I was forced to recover a fumble, and I ran like hell all the way to the goal line, making great progress, and I crossed it and realized it was the other goal line," Ogden said, to laughter. "I don't want to do that again. … So if we miss a 2018 bond measure, I don't lose any sleep over it, frankly." Ford said the target for a final environmental impact study is sometime in summer 2019. If everything proceeds on schedule, the MAX line could be built and begin operating by 2025. The steering committee also voted at Monday's meeting to create a community advisory committee. That body will consist of 19 people, 17 of whom have already been selected, with a mix of Portland, Tigard and Tualatin residents who will advise the steering committee as the Southwest Corridor project moves forward and a locally preferred alternative is ultimately identified.